Getting ready to retire? If you are a New York State & Local Retirement System member (NYSLRS), one of the most important things you’ll do is to decide how your retirement benefit will be paid. You do that by choosing a pension payment option. There are several options from which to choose and all of them provide you with a monthly benefit for life. You may elect to have your retirement benefit paid to you as a Single Life Allowance (Option 0). This will provide you with the maximum amount payable during your lifetime, with nothing payable to your beneficiaries upon death. Or, you may elect to receive a smaller monthly benefit to provide for a possible payment to a designated beneficiary after your death. 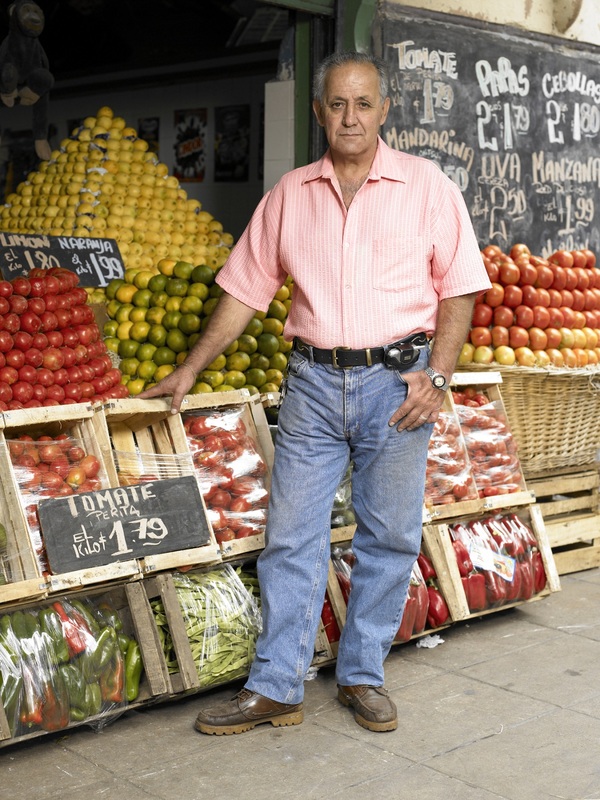 Does your beneficiary have other income? Is your beneficiary receiving his or her own pension? How much Social Security benefits does he or she get? Does your beneficiary have an Individual Retirement Account or a Deferred Compensation Plan? Do you have life insurance coverage? Remember to factor in payments from any life insurance you may have. 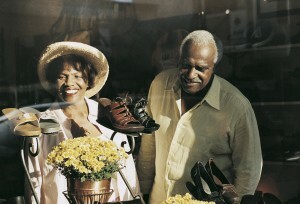 They can help your beneficiary make ends meet. What are your financial obligations? List the monthly expenses your beneficiary might have if you die. Is there a mortgage payment, car loan, other loans or obligations? Excluding your pension, will your beneficiary’s income be enough to cover all the expenses? Answering these three questions will help you determine which option best meets your needs. You may want to consult your retirement plan booklet to help you with your choice. You may also want to consult with a financial advisor before making your option selection. You must file your Option Election Form before the first day of the month following your retirement date. Though you have up to 30 days after your pension benefit becomes payable to change your selection, once the deadline has passed, you cannot change your option. Content last revised April 23, 2014. This entry was posted in General News, Members, NYSLRS Retirees, Pension System, Retirees and tagged beneficiary, ERS, New York State & Local Retirement System, NYSLRS, pension payment option, PFRS, retirement, retirement plan, retirement planning on April 23, 2014 by NYSLRS. As baby-boomers hit retirement age, a growing segment of our population is giving back to our state: public service retirees. NYSLRS Retirees are our neighbors, our friends and members of our family, and the pension money paid to retired state and local employees flows directly back into our communities, stimulating and growing our local economies. Approximately 80 percent of the cost of pension benefits comes from investment earnings of the Common Retirement Fund rather than the contributions of taxpayers. During 2012, retirees of the New York State and Local Retirement System (NYSLRS) were responsible for $11.1 billion in economic activity in New York State. 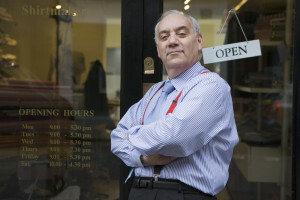 The goods and services NYSLRS retirees use create opportunities for new businesses in New York, help grow existing companies and create jobs. Public service retirees are particularly important to merchants because their retirement income provides a stable foundation of customers for local businesses. After a career working for the people of New York, public service retirees continue to contribute — not just as engaged citizens, but as individuals who bring value to the communities where they live. In 2012, 302,954 NYSLRS retirees and beneficiaries lived in New York State (outside NYC). As of March 2013, there were 413,436 NYSLRS retirees — 78 percent of whom have chosen to live here in New York. They are former employees of New York State, the university system, public authorities, local governments and schools, and many of them give back to their community as volunteers and supporters of charitable causes. NYSLRS retirees are widely distributed across different regions of New York. They make up 2.7 percent of the general population, but in some areas of the state, they account for nearly 5 percent of the residents. Retirees and their beneficiaries paid $1.4 billion in real property taxes — nearly twice their share of the NYS population (excluding New York City) 2012 – 2013 Fiscal Year. Schools, roads and government services of every sort — they all have something in common: public service retirees help make them possible. In 2012-2013, NYSLRS retirees paid $1.4 billion in real property taxes — that’s 4.6 percent of the total collected in New York. In some areas of the state, this figure is even higher. In the North Country, NYSLRS retirees pay nearly 8 percent; in the Capital District, nearly 7 percent of the property taxes collected. Additionally, NYSLRS retirees paid an estimated $488 million in state and local sales tax in 2012. Spending by NYSLRS retirees and their beneficiaries generated an estimated $246 million in state sales tax in 2012.
Business sectors that cater to the needs of retired consumers are booming. In the coming decades, industries such as health care, restaurants and entertainment are predicted to be areas primed for growth — and retired public employees will be an important part of its customer base. NYSLRS retirees spend a larger than average share of their income on industries that benefit local businesses and they are responsible for an estimated 61,000 jobs as a result of this spending. NYSLRS Retirees and their beneficiaries spent $8.9 billion within New York State in 2012. The pensions earned by public service retirees are a sound investment in New York’s future. These funds don’t just benefit those who receive them, but pay dividends to local businesses, build strong communities and create jobs. As the number of retired public service employees in our state grows, we can look forward to their help in building a stronger New York. Content last revised April 14, 2014. This entry was posted in General News, Members, NYSLRS Retirees, Retirees and tagged Economic Stimulus, New York State & Local Retirement System, NYSLRS, NYSLRS Retirees, Pension System, Retirees Contribute, Retirees Create Jobs, Strong New York on April 9, 2014 by NYSLRS. 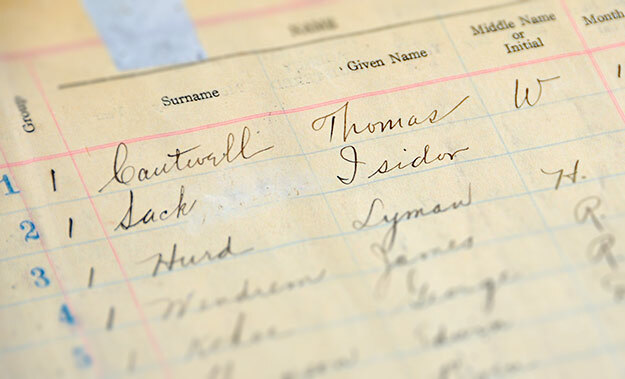 Thomas Cantwell’s name might not ring a bell for the average New Yorker, but his place in New York history was cemented long before he passed away on July 20, 1931 at the age of 91. 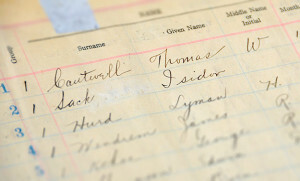 Born on December 18, 1839, Cantwell worked for the New York State Insurance Fund from 1890 through 1916, after which he became a file clerk for the New York State Office of the State Comptroller, retiring on July 1, 1921. At the time of his retirement, he earned $2,400 per year, which is the equivalent of $31,410 today. His retirement benefits amounted to $1,076 per year, or $14,435 today. As you’ve guessed by now, Cantwell was the first member of The New York State and Local Retirement System (NYSLRS) and his membership marked the start of a timeline that has stretched more than 90 years. New York’s first State Comptroller, Samuel Jones (1797), pictured left, and New York’s current State Comptroller, Thomas P. DiNapoli (2014), pictured right. 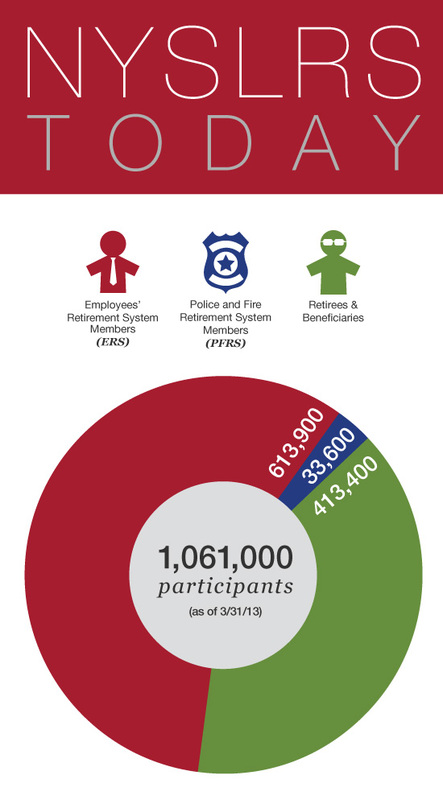 One of the America’s largest pension systems, NYSLRS is comprised of the Employees’ Retirement System (ERS), which was established in 1921 and currently has more than 612,294 members, and the Police and Fire Retirement System (PFRS), which was created in 1966 and has more than 35,100. The fiduciary and administrative head of the pension system is New York State Comptroller Thomas P. DiNapoli. The Comptroller acts solely in the best interests of the System’s members and retirees and ensures that the 346 different benefit programs offered by NYSLRS are managed properly and effectively. ERS provides service and disability retirement benefits, as well as death benefits to employees of participating public employers in non-teaching positions, exclusive of New York City. This includes uniformed services personnel, such as correction officers and sheriffs. PFRS provides service and disability retirement benefits, as well as death benefits to police officers and firefighters who work for participating public employers, exclusive of New York City. In addition to members, there are more than 440,900 pensioners and beneficiaries in the System bringing the total to more than 1,088,342 participants, as of March 31, 2016. 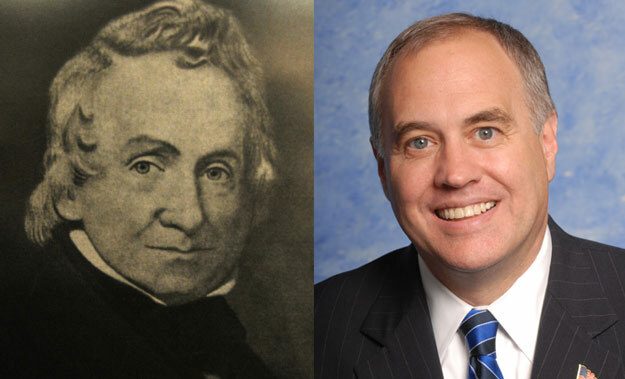 NYSLRS’ mission hasn’t changed since the days when Mr. Cantwell was working. 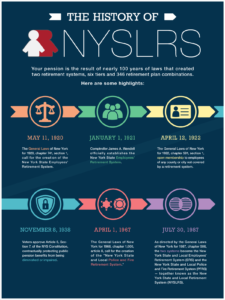 Whether we’re talking about that inaugural class of 1921 or the more than one million members and retirees of today, NYSLRS seeks to fulfill New York State’s promise of secure retirement benefits to enable members, retirees and beneficiaries to plan for a more financially secure retirement. 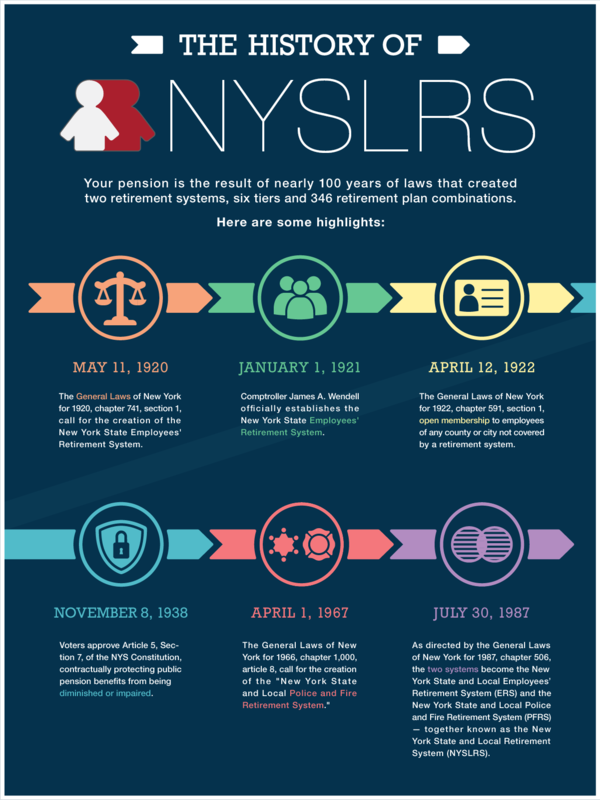 Perhaps most important of all, as a NYSLRS member or retiree, your pension system benefits are guaranteed under the New York State Constitution. Content last revised June 28, 2017. This entry was posted in General News, Members, Pension System, Retirees and tagged Comptroller Thomas P. DiNapoli, ERS, New York State & Local Retirement System, NYSLRS, One of America's Largest Pension Systems, Pension System, PFRS on April 2, 2014 by NYSLRS.